An online database which promises to change our understanding of English society on the eve and in the aftermath of the Norman Conquest has been launched online. PASE Domesday, which is released today, links information from the Domesday survey (1086) to maps showing the location of estates throughout England. The site enables users to list, map and quantify the estates of all the landholders named in William the Conqueror’s great Domesday survey of 1086 at the click of a button. Visitors can find out who owned their town or village, create maps and tables of the estates held by the same lords elsewhere in England, and examine the scale of the dispossession of the English by the Normans following the conquest of 1066. The launch coincides with, and will be featured in, a one-hour documentary on Domesday Book which will be broadcast on Tuesday, 10 August. It also forms part of a wider project, The Prosopography of Anglo-Saxon England (PASE), which aims to capture information relating to all the recorded inhabitants of England, from the late sixth to the late 11th century, in a single online database, and will be launched later this year. PASE Domesday is designed to help answer one of the great unsolved questions of English medieval history: What was the structure of English landed society in 1066? 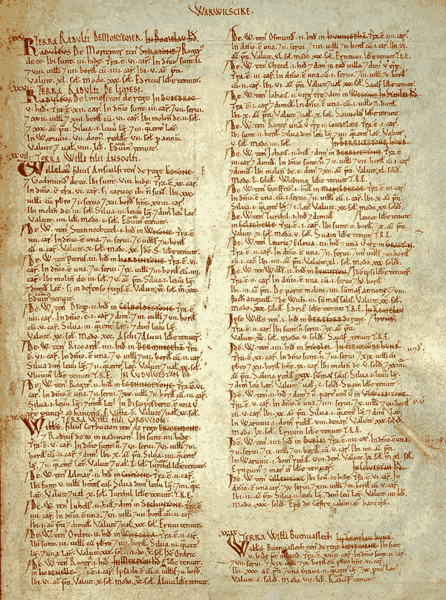 Although Domesday Book, the most complete survey of any medieval landed society, has been intensively studied, the sheer logistical difficulty involved in assembling information from its own contents and other sources has prevented scholars from forming a complete picture of the aristocracy that was defeated by the Normans at Hastings. By removing the logistical barriers, PASE Domesday opens up the prospect of a breakthrough in the way historians understand a critical phase of English history, enabling them to build up a profile of the Anglo-Saxon elite that was overrun after William the Conqueror’s victory. To create it, researchers painstakingly processed the vast quantity of data found in the various products of the Domesday survey of 1086. The work was carried out by scholars in the University of Cambridge’s Department of Anglo-Saxon, Norse and Celtic, and at King’s College, London. The PASE project will be using the database as they commence a new project called Profile of a Doomed Elite, which is funded by the Leverhulme Trust, and begins in September 2010. The PASE Domesday database also hopes to engage the general public and generate new interest in medieval history. Dr Baxter explains, “Ever wondered who owned your town or village at the time of the Norman conquest? It’s now possible to find out at the flick of a button. And having done so, you can create maps and tables of the estates held by the same lords elsewhere in England. Results are delivered quickly, and the scale of the dispossession of the English by Norman billionaire-like barons comes vividly to life. Further details about the PASE project as a whole can be found at http://www.pase.ac.uk PASE Domesday will feature in the “Domesday” special as part of the BBC’s Norman Season on Tuesday, 10 August, at 8pm.